**THIS COMPETITION IS NOW CLOSED** HE WAS THE tousled-haired folknik turned pint-sized glam superstar and today, more than 35 years after his untimely death, Marc Bolan remains a true pop icon. 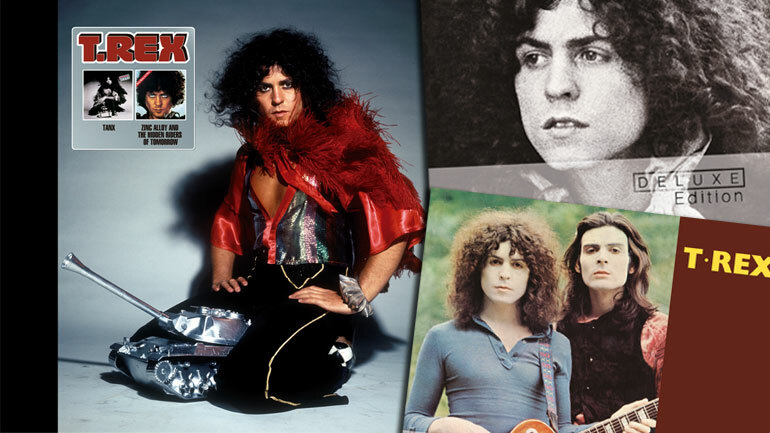 This week, four classic Bolan albums are reissued in deluxe edition format – A Beard of Stars, T.Rex and a double CD set featuring Tanx and Zinc Alloy And The Riders of Tomorrow/A Creamed Cage. 1970's exploratory A Beard of Stars – his last record under the Tyrannosaurus Rex name – and the proto-glam of the following year's T.Rex laid the foundations for the explosion of T.Rextasy that was soon to follow. Each reissue comes with a bonus disc of rarities. Tanx (1973) and Zinc Alloy And The Riders of Tomorrow/A Creamed Cage (1974) meanwhile, have been remastered by Bolan’s long-serving producer Tony Visconti and are packaged together in a limited edition collector’s set.